Old Hejazi, or Old Higazi, is a variety of Old Arabic attested in Hejaz from about the 1st century to the 7th century. It is the variety thought to underlie the Quranic Consonantal Text (QCT) and in its later iteration was the prestige spoken and written register of Arabic in the Umayyad Caliphate. Old Ḥejāzī is characterized by the innovative relative pronoun ʾallaḏī (Arabic: ٱلَّذِي‎), ʾallatī (Arabic: ٱلَّتِي‎), etc., which is attested once in the inscription JSLih 384 and is the common form in the QCT, as opposed to the form ḏ- which is otherwise common to Old Arabic. The infinitive verbal complement is replaced with a subordinating clause ʾan yafʿala, attested in the QCT and a fragmentary Dadanitic inscription. 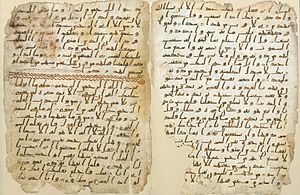 The QCT along with the papyri of the first century after the Islamic conquests attest a form with an l-element between the demonstrative base and the distal particle, producing from the original proximal set ḏālika and tilka. The emphatic interdental and lateral were realized as voiced, in contrast to Northern Old Arabic, where they were voiceless. The glottal stop /ʔ/ was lost in Old Hejazi, except after word-final [aː]. It is still retained in Modern Hejazi in few positions. The Old Hejazi phonemes /pʰ/ ⟨ف⟩ and /ɬ/ ⟨ش⟩ correspond to Modern Hejazi /f/ and /ʃ/. It is not known whether the Modern Hejazi phonemes /d͡ʒ/ and /ɡ/ (represented by ⟨ج⟩ and ⟨ق⟩, respectively) evolved from earlier old [ɟ ~ ɡʲ] and [q] and, if so, when this change occurred. The QCT attests a phenomenon of pausal final long -ī dropping, which was virtually obligatory. Line 5: Elision of the definite article's vowel in /lʿarš/ is supported by similar contextual elision in the Damascus psalm fragment. /astawē/ with fixed prothetic /a-/ is considered a hallmark of Old Hejazi, and numerous examples are found in the Damascus psalm fragment and support for it is found as well in Judeo-Christian Arabic texts. The word /ʿalay/ contains an uncollapsed final diphthong. Line 8: Old Hejazi may have had /huww/ < */huwwa/ < */hūwa/ < */hūʾa/ with an originally long vowel instead of /huwa/ < */huʾa/ as in Classical Arabic. This is supported by its spelling هو which indicates a consonantal /w/ rather than هوا had the word ended in a /ū/. Proto-Arabic nouns could take one of the five above declensions in their basic, unbound form. The definite article spread areally among the Central Semitic languages and it would seem that Proto-Arabic lacked any overt marking of definiteness. The Qur'anic Consonantal Text presents a slightly different paradigm to the Safaitic, in which there is no case distinction with determined triptotes, but the indefinite accusative is marked with a final /ʾ/. In JSLih 384, an early example of Old Hejazi, the Proto-Central Semitic /-t/ allomorph survives in bnt as opposed to /-ah/ < /-at/ in s1lmh. Old Ḥejāzī is characterized by the innovative relative pronoun ʾallaḏī, ʾallatī, etc., which is attested once in JSLih 384 and is the common form in the QCT. A single text, JSLih 384, composed in the Dadanitic script, from northwest Arabia, provides the only non-Nabataean example of Old Arabic from the Ḥijāz. A growing corpus of texts carved in a script in between Classical Nabataean Aramaic and what is now called the Arabic script from Northwest Arabia provides further lexical and some morphological material for the later stages of Old Arabic in this region. The texts provide important insights as to the development of the Arabic script from its Nabataean forebear and are an important glimpse of the Old Ḥejāzī dialects. The QCT represents an archaic form of Old Hejazi. The Damascus Psalm Fragment in Greek script represents a later form of prestige spoken dialect in the Umayyad Empire that may have roots in Old Hejazi. It shares features with the QCT such as the non-assimilating /ʾal-/ article and the pronominal form /ḏālika/. However, it shows a phonological merger between [eː] and [aː] and the development of a new front allophone of [a(ː)] in non-emphatic contexts, perhaps realized [e(ː)]. ^ a b Al-Jallad, Ahmad (2015-03-27). An Outline of the Grammar of the Safaitic Inscriptions. Brill. p. 48. ISBN 9789004289826. ^ Al-Jallad, Ahmad (2015). "On the Voiceless Reflex of *ṣ́ and *ṯ ̣ in pre-Hilalian Maghrebian Arabic". Journal of Arabic Linguistics (62): 88–95. ^ Putten, Marijn van. "The *ʔ in the Quranic Consonantal Text - Presented at NACAL45 (9-11 June 2017, Leiden)". ^ Putten, Marijn van (2017). "The development of the triphthongs in Quranic and Classical Arabic". Arabian Epigraphic Notes. 3: 47–74. ^ Stokes, Phillip; Putten, Marijn van. "M. Van Putten & P.W. Stokes - Case in the Quranic Consonantal Text". ^ Al-Jallad, Ahmad. "One wāw to rule them all: the origins and fate of wawation in Arabic and its orthography". ^ "The people of the Thicket: Evidence for multiple scribes of a single Archetypal Quranic Text". Phoenix's blog. Retrieved 2017-06-01. ^ "Can you see the verb 'to see'?". Phoenix's blog. Retrieved 2017-08-14.